Photograph courtesy Neil Cannon. 25052 pauses at Honiton with the returning milk wagons from Chard Junction, a heavy downpour has just ended, the Class 25 waits for an up train to pass. The seventeen year and four month career of D5202/25052 included almost ten years allocated to London Midland depots, the remainder on the Western Region. Assuming the transfer to Skipton (10G) is correct, D5202 was the only Class 25 ever allocated there. Royal Train cabling modification (cab front access panel) (removed 11/1975). Time between last Classified repair and withdrawal: 58 months. Time between withdrawal & scrapping: six weeks (possibly the shortest time for any Class 25 between withdrawal and scrapping). September 1963 to Toton (16A) (depot code change). January 1964 to Longsight (9A). May 1964 to Skipton (10G). July 1964 to Longsight (9A). September 1964 to Toton (16A). December 1964 to Nottingham (16D). June 1965 to Saltley (2E). April 1966 to London Midland (Midland) Lines LMML. November 1967 to Springs Branch (8F). January 1972 to Bristol (82A). 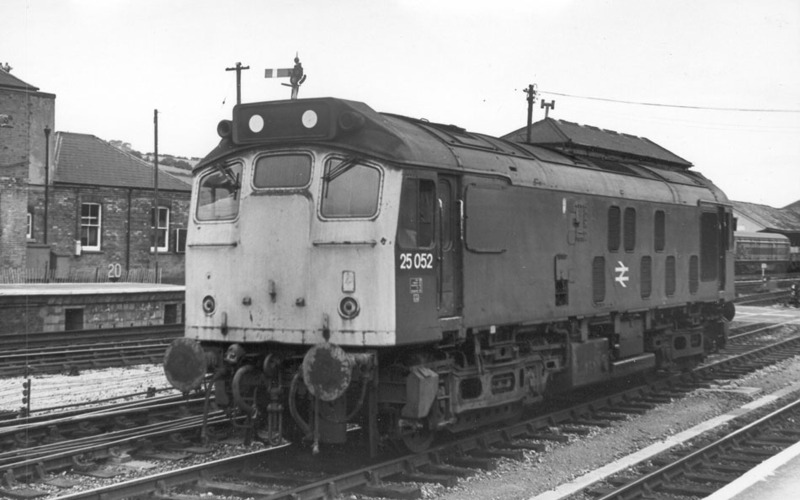 25052 was the 46th Class 25 withdrawn, one of four retired during October 1980. 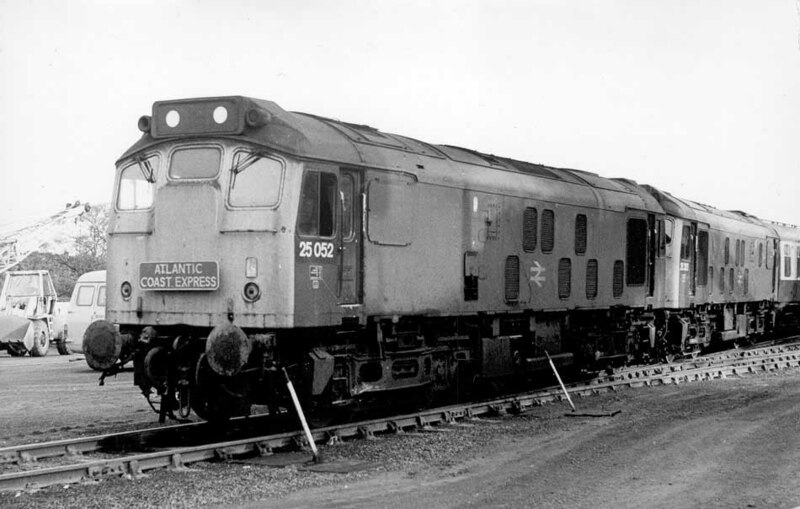 After withdrawal 25052 was moved to Swindon Works on October 8th 1980 and scrapped there during the second week of November 1980. 25052 at Swindon Works on October 26th 1980. At this point the locomotive is very much intact, however 25052 would have a very quick demise, within three weeks of this view 25052 would be no more. Noted Derby Works August - October 1964. Noted Derby Works May 1965. Noted Derby Works October & November 1975 (gangway doors sheeted over). Noted Derby Works August 1977. Condition August: blue livery with full yellow cab fronts (an early example in blue livery), gangway doors present, BR emblems on cab sides & numbers on bodysides. Photograph collection of webmaster. 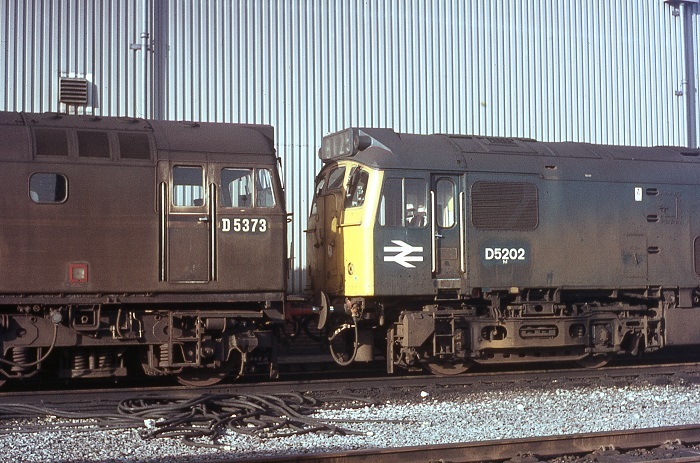 Cabs of D5202 & D5373, no details provided but possibly Toton about 1967. The 1F51 21.25 Preston - Liverpool Exchange was worked by 5202 on March 4th & March 11th. On June 29th 5202 & 7532 worked a roundtrip Wellingborough - Brighton day excursion. On August 15th 5202 & 5209 (or 5208?) worked a Blackpool North - Glasgow Central service via Beattock due to a derailment at Kirkconnel on the GSW line. At this time the Class 25s were no strangers to passenger work over the northern end of the WCML, however to have the opportunity to ride over both Shap & Beattock on the same service no doubt added a little spice for any enthusiasts on the train. On November 21st the FA Cup first round matches began, with 5202 & 7650 working a Wigan - Tyne Dock football special. The empty coaching stock ran onto South Shields allowing the locomotives to reverse and head off to Heaton Carriage sidings. On June 27th the 15.20 York - Bristol Temple Meads saw 5202 take over at Sheffield, remaining on the train to Bristol Temple Meads. On November 22nd the 08.00 Bristol Temple Meads - Penzance saw 5202 replace 6553 & 824 (failed) at Exeter, the Class 25 worked at least as far as Plymouth. On August 11th 5202 worked the 09.51 Exeter St Davids - Barnstaple and the return 12.20, the 15.55 Exeter St David - Barnstaple and the return 17.55. On June 13th a faded, work stained 25052 was noted at Newton Abbot assisting 47083 with a westbound passenger service. Condition June: blue/yellow livery, gangway doors present, no blanking plates, hand/footholds plated over, Royal Train circular communication access cover in driver's side gangway door. The 06.00 Nottingham - Lincoln parcels was worked by 25052 on April 14th. During May 25052 was transferred to Laira, resulting in the locomotive featuring on the summer passenger locals in the Exeter & Plymouth area. On June 1st 25052 worked the 14.10 Exeter St. Davids - Paignton, no doubt many other similar workings like this took place during this summer and the summers of 1977 - 1980. On July 28th was noted at 6.45am at Lostwithiel with an unidentified Up freight. On the evening of August 6th 25052 & 25220 were noted passing Liskeard with a St Blazey - Temple Mills freight. 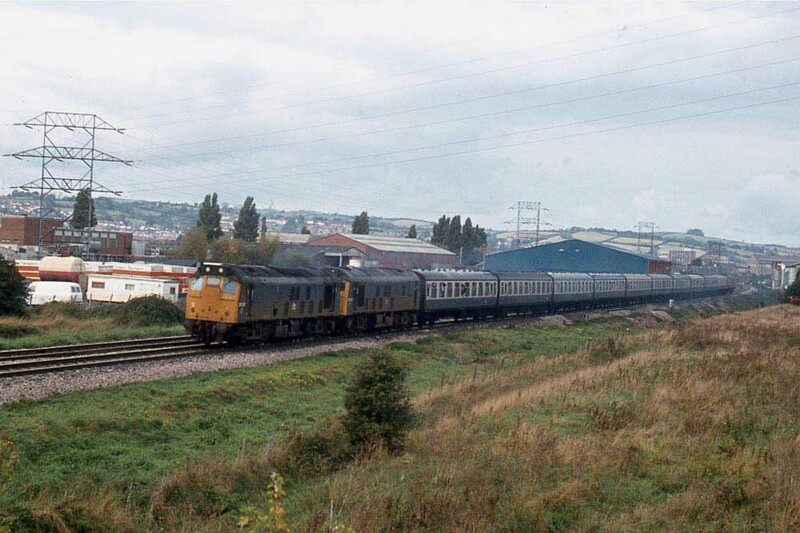 On September 13th the 10.20 Penzance - Leeds was worked to Plymouth by 47001 & 25052. A Christmas working saw 25052 handle the 19.35 Exeter St. Davids - Paignton on December 23rd. 1977 produced a further selection of local Exeter area passenger workings. Other highlights included on June 4th a Bideford - Paddington day excursion to celebrate the Queen's Silver Jubilee was worked from Bideford to Exeter St. Davids by 25052 & 25223. 25052 was noted working an up empty coaching stock near Bishopsteignton on August 28th. The next day (29th) a charter train was noted between Meeth & Barnstaple with 25052 & 25223 top and tailing. On October 9th a Paddington - Kingswear railtour was worked roundtrip Exeter St. Davids - Paignton by 25052 & 25223 (see image below). Photograph courtesy Peter Lovell. 25052 & 25223 pass Marsh Barton on an overcast October 9th 1977 having just taken over from 40081 & 40084 at Exeter. The Class 25s will work the special down to Paignton. On a wet April 1st 25052 & 25224 were noted at Exeter St Davids with a mixed train (one GUV, two Mark I coaches, three CCTs and two PMVs), possibly the early morning Barnstaple - Exeter mixed service. On the late evening of April 11th 25052 was stabled at Exeter. The next day (12th) 25080 & 25052 were noted as double headed light diesels in the Up direction passing Plymouth at 1.30pm (to Laira to refuel?). Later that afternoon the same pair of light diesels were noted in the Down direction passing Plymouth to work a St Blazey - Carlisle freight? 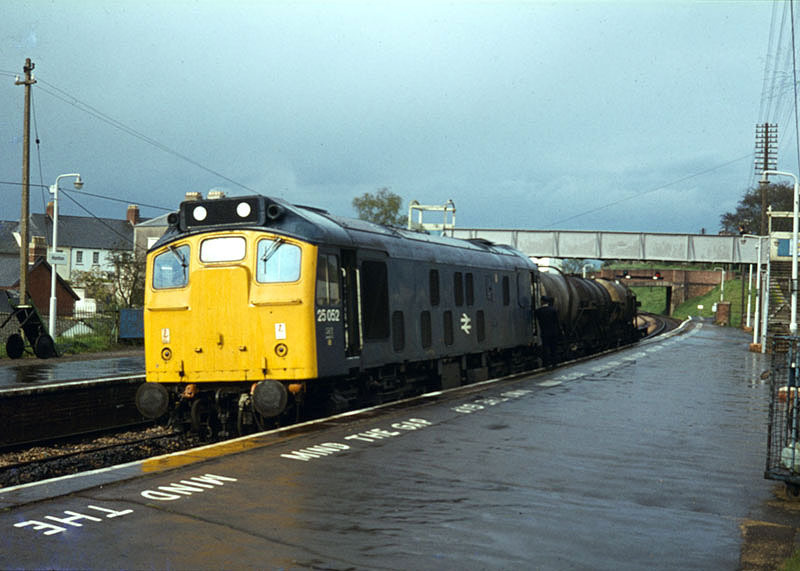 On April 21st 25052 & 25170 worked a St Blazey - Carlisle freight to Exeter Riverside. On May 5th 25052 & 25225 worked a St Blazey - Carlisle freight to Exeter Riverside. Late in the afternoon of May 10th 25052 was noted light diesel at Plymouth in the up direction. On May 12th 25052 & 25155 were noted passing Plymouth at 8.30pm with the down clay empties. Photograph courtesy Roger Geach. 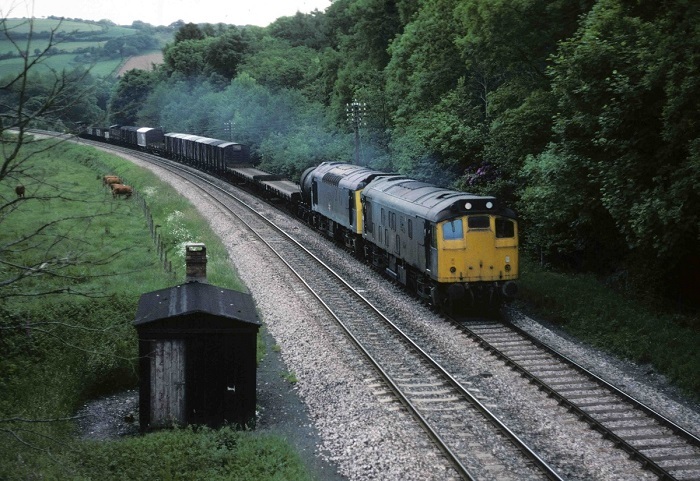 25052 & 25207 head north at Respryn Bridge (near Bodmin Road) on June 12th 1978 with a St Blazey - Carlisle freight. On July 10th 25052 was noted at St Erth with a freight. Typical of the workings of the summer of 1978 included the 16.40 Plymouth - Paignton on July 25th and the next day's 10.00 Paignton - Plymouth. On July 29th 25052 worked the 06.35 Plymouth - Old Oak Common vans at least as far as Reading West (possibly further). On the morning of July 31st 25052 was noted at Exeter stabling point, it would later be used on the 19.35 Exeter - Paignton. On the morning of August 1st 25052 was at Exeter stabling point, later that day it would work the 13.40 Riverside - Chard milk empties and return. On the morning of August 8th 25052 was at Exeter stabling point. On September 13th 25052 & 25207 worked the 20.50 St Blazey - Temple Mills to Exeter Riverside. Two days later on September 15th 25052 & 37142 worked the 19.50 St Blazey - Carlisle to Exeter Riverside. On September 22nd 25052 & 37267 worked the 19.50 St Blazey - Carlisle freight to Exeter Riverside. The 'Welsh Wonder Relief' railtour on December 2nd from Paddington - Blaenavon saw the Paddington - Severn Tunnel Junction leg handled by 25052 & 25225. On April 17th 25052 worked the 07.46 Barnstable - Exeter. On June 13th 25052 was noted arriving at St Erth from Hayle Wharf with two wagons for the up side goods yard to be loaded with scrap metal. A week later on June 20th was noted at Exeter St Davids with a short freight from the direction of Exeter Central. 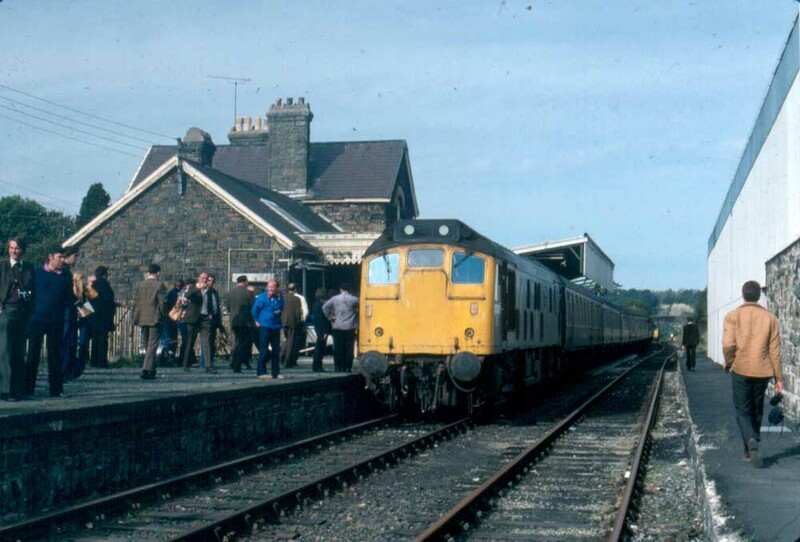 The summer of 1979 produced a considerable quantity of local Exeter area passenger workings. June 30th's 22.41 Manchester Piccadilly - Penzance was worked forward from Plymouth by 25052 & 25080. On August 17th was noted at Exeter Central having collected empty Presflos from the nearby Blue Circle Cement terminal in Exeter Central goods yard. The cement empties would be headed to Riverside Yard for a service back to Westbury cement works. After a summer of local workings the Crewe - Meeth/Meldon Quarry 'Atlantic Coast Express' on October 20th/21st was worked roundtrip Exeter St. Davids - Meeth/Meldon Quarry by 25052 & 25223. Photograph collection of webmaster. This view is believed to be of 25052 & 25223 at Meldon Quarry on October 20th 1979. Photograph collection of webmaster. The Wirral Railway Circle's 'Atlantic Coast Express' on October 20th 1979 stands at Torrington with 25223 & 25052 (at the far end). This railtour had started out the previous evening at Crewe behind Class 47 No.47515. At Exeter St. Davids the two Class 25s took over for a trip to Meldon Quarry before returning to Crediton to take the line to Barnstaple, Torrington and Meeth. Then it was back to Exeter for the long haul back to the Midlands. During the second week of May (exact date uncertain) 25052 & 37142 were noted at Falmouth with mineral wagons. It must be assumed that 25052 did work some passenger services during 1980, if so these workings went unrecorded. Photograph collection of webmaster. An undated view 25052 at Exeter St Davids. On June 24th 25052 worked the afternoon Truro Yard - St Blazey freight, noted passing Burngullow Junction with just three wagons. 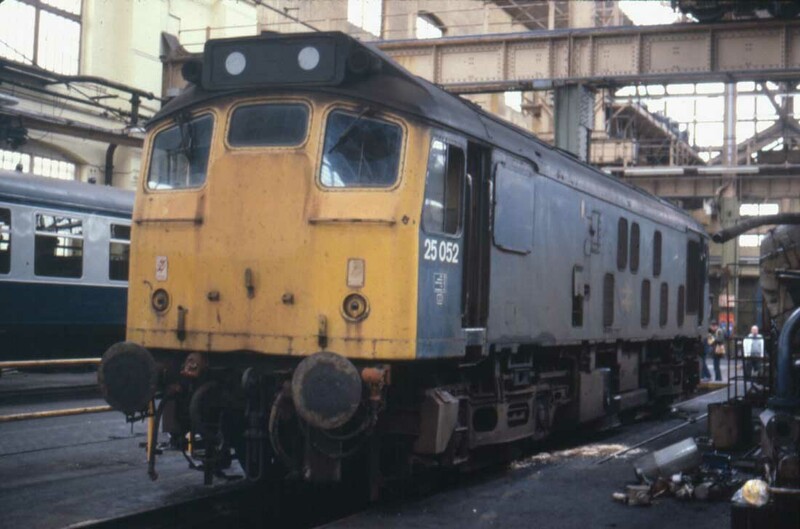 The end of the summer timetable saw 25052 withdrawn during the first week of October, it was quickly moved to Swindon Works and scrapped there by early November 1980, one of the quickest disposals recorded for any Class 25. Withdrawn at the same time as 25052 were Laira shedmates 25223 & 25225. Page added May 3rd 2013.